A wedding in two counties today – Rachael & Ashley married in Yorkshire, and then popped over the border into Lancashire for their reception. But a little rain didn’t stop our bridal party today, big umbrellas’ saving the day! A beautiful meal was followed by a lovely speech from Rachael’s Dad. Best men Chris & Tom rounded off the speeches with a great double act. 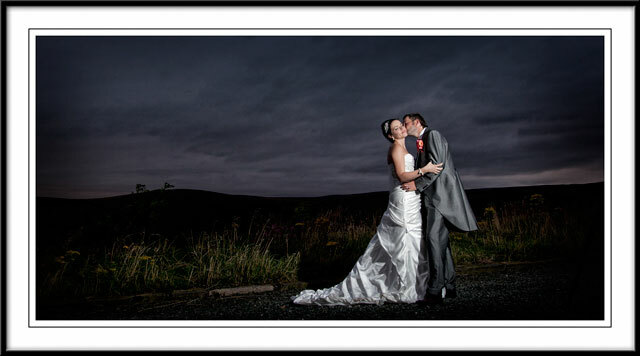 Conditions did not improve for much of the day but Rachael & Ashley were good sports and ventured out early evening to capture some great off camera flash shots, the backdrop of course been the 180 degree vista of the stunning moors. We would like to thank Anthony, John and Jake and the staff at The Saddleworth Hotel for all their help in making this a memorable day for everyone.